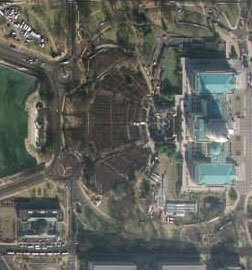 Inauguration Satellite Images — Geoff Wood, coworking guy. The estimated 2 million people witnessing the event live are pictured from space as big masses of black on the otherwise green/brown grass. A closer view of the "ticketed" crowd that had seats in front of the Capitol Building's steps.